Licensing! Time to do paperwork, getting licensing agreements underway. As soon as we get full funds raised, off to the replication plant. Kickstarter donors, participants in the film and crew will get their copies first. We’ll open things up from there. Printed a full-size mock-up of Eric’s box today. I am thrilled and thanks Eric! It has been a long while, but lots of GOOD NEWS to report. First, Eric O’Malley has designed the DVD box and it’s great! We’re finalizing the text now. Most importantly, we recently secured a matching grant, for up to $10,000, from this point to raise the finishing funds for the film. Funds are used to pay for the several archives, the animator, musician/composer. Anything over the bare-minimum $15,000 goal will be used to enter the Architecture & Design Film Festival. Three accredited festivals are required for Academy Award entry, but that’s a ways out. Roughly $400 is required for each festival entry. Third, details are being worked upon for a fundraiser screening in Scottsdale-area and a premiere at Hillside Theater at Taliesin. Stay tuned, more info soon! Word was received today, Jerome Foundation has elected not to help fund the John Howe documentary this year. I will consult with the film’s advisors regarding the next steps. While it has been quiet, it doesn’t mean that things are not going on with the Howe documentary. A grant application for finishing funds was successfully submitted (decisions on that are in February). Also this last week, a two review copies of the film went out to film advisors! Before starting research for the film, I was aware that John taught himself to weave in the 1940’s. Digging into the origins of that further, it became clear that under Frank Lloyd Wright and the Taliesin Fellowship’s influence; Jack/John began designing all types of geometric, or nature abstractions as far back as 1933/4. While there is no one who can directly comment today, it neatly coincides with the origins of Taliesin Box Projects. Observed together, these abstract drawings form a small and beautiful collection, albeit separate from architectural drawings. Some were used as textiles, paintings, Christmas cards, stained glass, or stationary. The one consistent thing about their use was – they were always intended as a personal gift. Interestingly, John would do these drawings occasionally, even after he retired in 1988. It was part of his soul. They formed much of the artwork in their homes. Mrs. Howe allowed me to photograph many of them, and shared copies of others. One of John’s textile designs was so compelling, that it was hard to fathom why it went unexecuted. At some point, I asked Mrs. Howe for permission and took up hand embroidery. 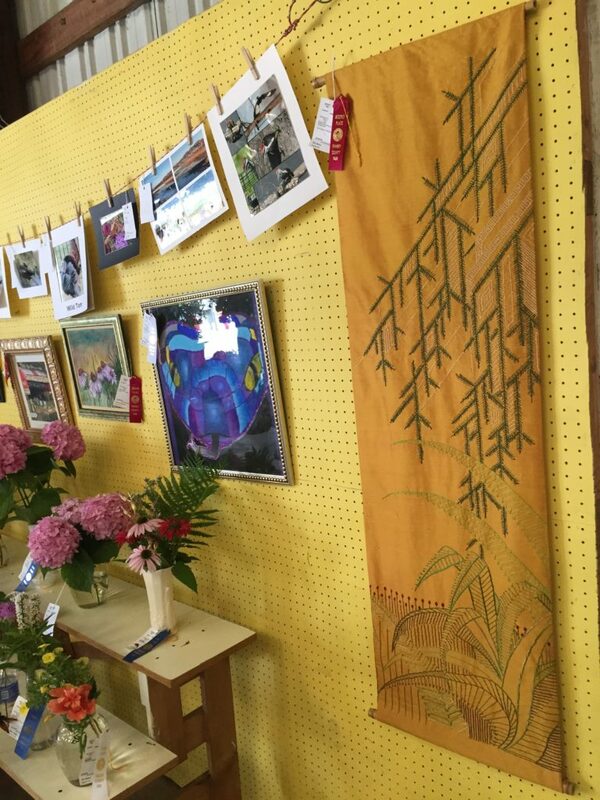 On a whim, I entered that embroidery in the county fair this week. It took second place in it’s category! Hard to beat good design. Thanks Jack! We are pleased to announce Preservation Alliance of Minnesota has partnered with our film, to serve as fiscal agent seeing us through post-production! Now confirmed, we can provide IRS-qualifying tax donation documentation to those who donate to this film. It will take a combination of support to reach an approximate $44,000 goal. We will seek corporate partners to help sponsor the film. We also plan on applying government history/educational grants. It will also take you! Your interest in architecture and preserving the legacy of John Howe is what this is all about. If you have an interest in Taliesin and Frank Lloyd Wright, this film is a crucial piece in understanding the the remarkable modern style that developed there! Please consider helping this film across the finish line.